Am I a writer and when can I justify calling myself one? It has been a topic of discussion recently on social media with polarising views. I am definately not an author as I do not have a published book but in an age of self publishing I could cobble together a manuscript of gobblygook and send it out in the world but would that entitle me to the label? I don’t think so but the boundaries are no longer black and white and there are many shades of grey. Do you become an author when you have written a book or is it after so many sales or reviews? I am a novice in this craft but I hope to learn it well enough to become a published writer but then grey shades appear again, I have published this post so does this count or does it require an external source publishing your work (I refuse to count letter I had published in a magazine at 12). I could go round in circles with is topic and it still not become clearer. If asked what I do, I would cringe if I said “I am a writer” as it is just a hobby and dream but one day I would like to say it for real. Am I competent or good enough to write? 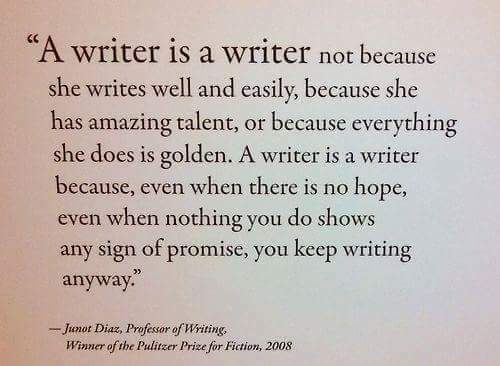 Ultimately, that is for my readers to say when my novel or stories are released into the world after my word count increases but one day I hope I can develop to be. Some books enter the world and draw many in with the authors storytelling or clever marketing while others have a small loyal following. My aim is to write ‘The Hollow’ and if my daughter enjoys it I will be happy. Will I ever have the courage to share my stories with others? Blogging and sharing work at writing group is a start but will I combat fear of publishing The Hollow – watch this space! Have I got the stamina to finish? Not only finish this draft but to edit, find a publisher and do the marketing. The illusion of posting my manuscript off like Jo in Little Women and be published has been shattered with reading other peoples experiences. I want to write – nope, need to write but living with a chronic illness I know life can throw obstacles at you that are difficult to climb over. This is my biggest insecurity as I struggle daily to balance medication, health and family life with writing. Luckily, I live in the age of technology so when I can’t write, I can type or use apps on my phone and if that fails, once I have mastered the art of Dragon and he listens to me, I can talk. If I can’t manage any of those, I can imagine other scenes and stories for when I can. I have many other insecurites but they will just have to stay contained for now.